In my research project, I am now done with my annotated bibliography, in which I cited the websites and print sources I used to research my issue. After citing the sources, I wrote a short summary about each article and explained the how credible each publisher and author was. 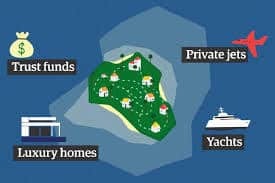 After reading numerous different articles about the paradise papers leak and the tax evasion problems it has exposed, I am learning more and more about the scope and broad reach of people around the world that have been affected by the actions shown in the paradise papers. Also, the more I read the more I feel disgusted with the actions of the people who committed the actions expressed in this leak. The amount of money which has been stolen from the people of the US and other countries around the world by greedy people and corporations who decide they are above the law and expectations of society to pay their dues as the rest of us do. I believe these people should be forced to pay back the money they avoided paying plus fines based on how much they extorted. Some sources explain that some of these actions are legal. In these cases I believe that the legislation allowing people to avoid paying their taxes should be rewritten or abolished so they can no longer avoid paying the taxes they owe the countries they are allowed to operate and live in when they are asked to give their fare share of taxes. Based on the evidence and facts given by these sources concerning the information about the paradise papers. Some of the actions committed by these people are illegal and have greatly affected society and many people around the world in negative ways, therefore I believe they should be charged with crimes according to their actions and current legislation should be rewritten to not allow these things to happen again. Paradise Papers by Fritch is licensed under a Creative Commons Attribution-ShareAlike 4.0 International License.